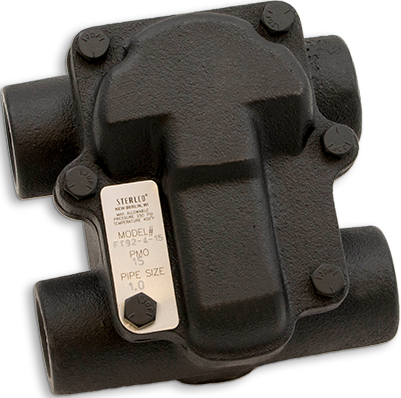 The Sterlco® (Model FT-92) Float & Thermostatic Trap with Double Inlet/Double Outlet configuration is applicable to all types of steam heating systems and steam process equipment. These traps operate efficiently with pressures up to 15 lbs. for lower pressure applications and up to 125 PSI for higher pressure applications. Their purpose is to move air and water while preventing steam from entering the return piping. These traps are manufactured in four sizes (3/4”, 1”, 1-1/4” & 1-1/2”) for handling capacities of 275 to 4,300 lbs. of condensate per hour. Four (4) possible connections allow a greater flexibility in piping. These traps can be piped in and out from either side, for a total of four piping combinations depending on your particular needs. All working parts are made of non-corrosive metals especially adapted for this service, and each trap is individually tested for reliable operation. Simple, rugged construction. This Sterlco® trap consists of a body, cover and float valve assembly. Body and cover are cast iron; all working parts are made of non-corrosive metals especially adapted for this service. Instantaneous valve action. Design of the float valve assembly permits rapid and positive valve action. Location of the valve assures a deep water seal at all times. Minimum maintenance. All working parts may be inspected, removed or repaired without disturbing piping connections. Clean-out plug at bottom of trap body permits easy flushing of dirt. Why Choose FT-92 Float and Thermostatic Steam Trap?